For such small and delicate creatures, they can pack mighty painful stings. 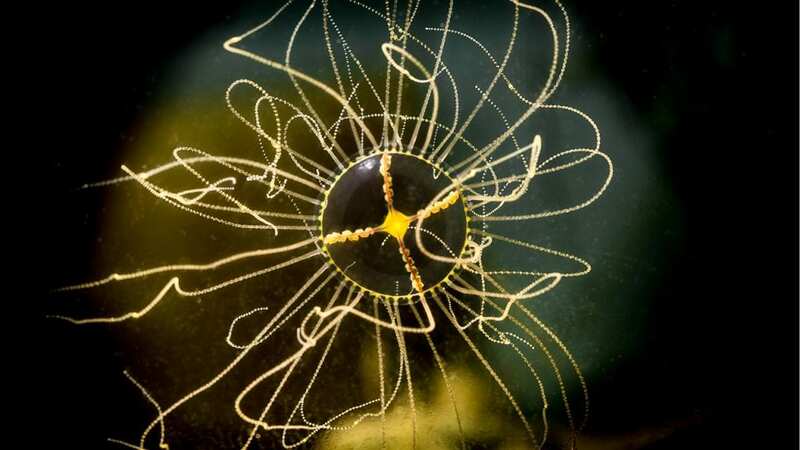 Known as clinging jellyfish because they attach themselves to seagrasses and seaweeds, Gonionemus is found along coastlines in the Pacific and Atlantic oceans, and in particular in waters near Vladivostok, Russia. Exactly how these jellyfish, long assumed to be native to the North Pacific, became so widely distributed throughout the world has perplexed researchers for decades. Interest in the jellyfish has renewed in recent years, when stings with symptoms similar to those previously described off of the Russian coast— including severe pain, respiratory and neurological symptoms—suddenly started occurring in Cape Cod and nearby regions. 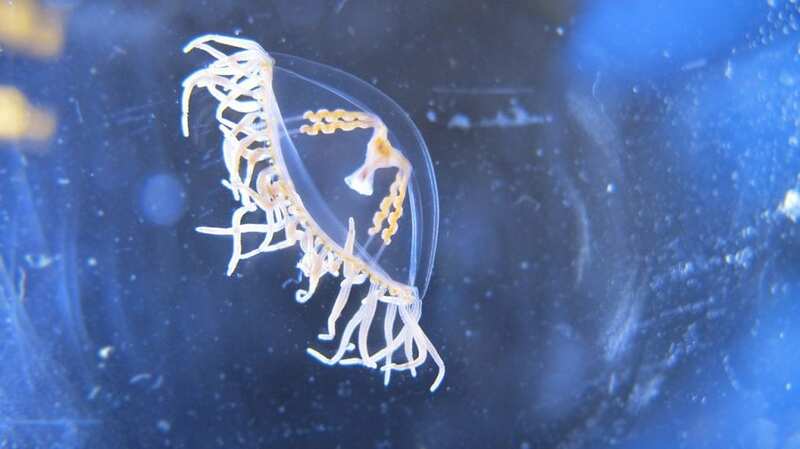 Now, the first genetic study of the diversity of clinging jellyfish populations around the globe has discovered some surprising links among distant communities of jellies and also revealed there may be more than one species of the infamous stinger. The paper published April 18 in the journal Peer J.
Annette Govindarajan, a biologist at Woods Hole Oceanographic Institution (WHOI) and lead author of the paper, has studied these jellies for the past three years with the ultimate goal oftracing the species’ origin off the U.S. East Coast, where it is thought to be invasive. The clinging jellyfish first appeared in the Cape Cod area in 1894. Scientists in Woods Hole studied the clingers in the early 1900s. Following an eelgrass die-off, their numbers dwindled. Then the tiny creatures, whose sizes range from about the diameter of a dime to a quarter, nearly vanished in the 1930s. Prior to that, says Govindarajan, researchers and others who were handling the jellies in Massachusetts made no reports of stings. “The Cape Cod populations were assumed to be a variety that didn’t cause severe stings,” Govindarajan adds. It wasn’t until 1990 that the clinging jellyfish re-appeared in Cape Cod and painful stings were first reported. These observations lead Govindarajan and her colleague, WHOI researcher Mary Carman to suggest in a previous paper that an invasion from a toxic population had occurred. The new study shows that the story is much more complex than previously thought. The researchers uncovered a genetic match between populations of clinging jellyfish in the Vladivostok, Russia-area—specifically the area well known to cause severe sting reactions—and those found along the U.S. East Coast in the Northwest Atlantic. Working with Carman and colleagues Marat Khaidarov and Alexander Semenchenko from the A.V. Zhirmunsky Institute of Marine Biology, National Scientific Center of Marine Biology, Far East Branch, Russian Academy of Sciences in Vladivostok, Russia, and John Wares from the University of Georgia, Govindarajan obtained tissue samples for DNA sequencing. The jellyfish samples came from several Atlantic and Pacific locations. Their analysis identified seven variants, some of which were specific to only one location, and others that were shared among communities in distant locations. Interestingly, jellies from the Northeast Pacific and Northeast Atlantic locations shared a haplotype that was sufficiently different from Northwest Atlantic and Northwest Pacific jellyfish, which suggests the possibility that the two related groups may represent different species of Gonionemus. Understanding the relationship between the genetic variants and toxicity is something the researchers would like to pursue in the future. “It could very well be that the toxicity is a function of both genetics and the environment, perhaps something in the environment is triggering the toxicity,” Govindarajan says. 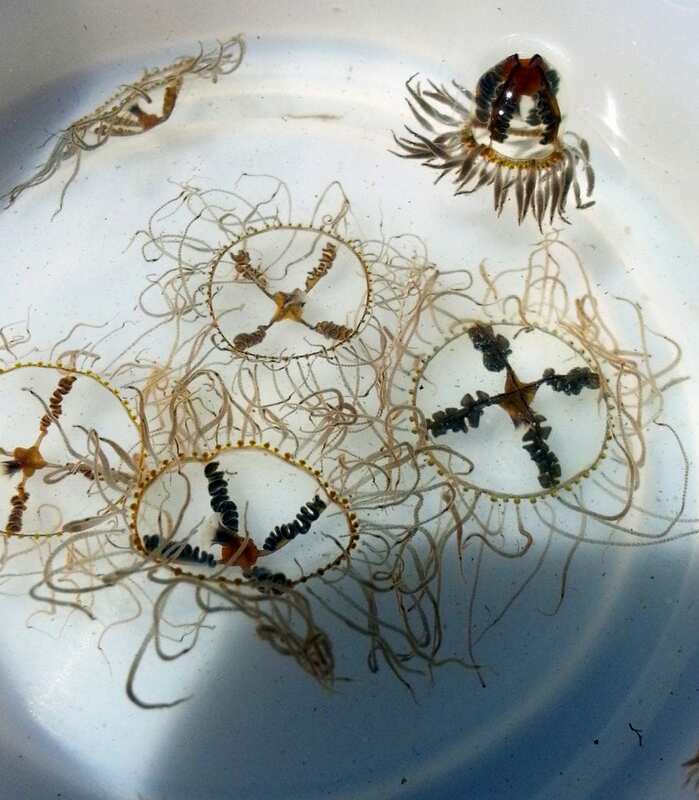 While the animals bloom in the summer months, beginning in June through September, Govindarajan says swimmers and beachgoers shouldn’t be overly concerned as the fragile stingers are not found along sandy beaches in high-energy areas where there are waves. The lack of movement in open waters also makes the mystery of how the different varieties have become so widespread even more intriguing. 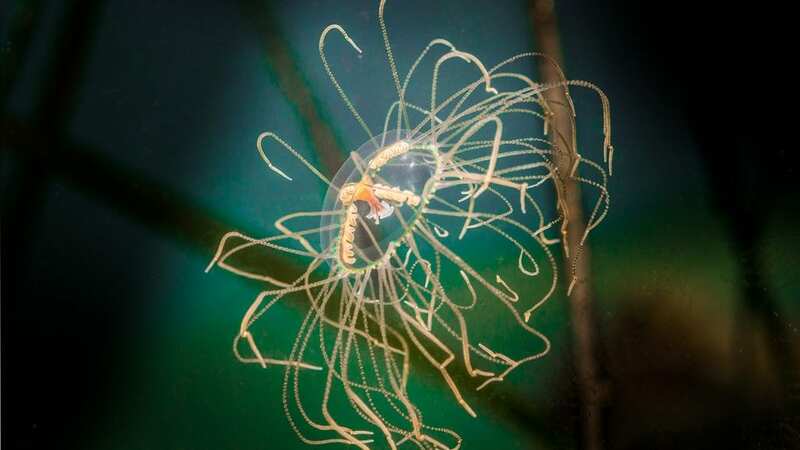 The jellyfish are produced by microscopic polyps that are only about a millimeter or less in size, which Govindarajan says is a stage where they could easily hitchhike on a blade of eelgrass, an oyster shell or even a boat hull. Govindarajan and her coauthors hope to obtain funding to do additional genomic analyses that will give greater resolution and suggest genetic markers to help reveal more about the species and its toxicity. They hope this will lead to a better understanding of how invasive forms of the jellyfish are dispersing, so that further spread can be prevented. This work was supported by grants from the Woods Hole Sea Grant, Nantucket Biodiversity Initiative, the Kathleen M. and Peter E. Naktenis Family Foundation, the Town of Oak Bluffs Community Preservation Committee, and the Russian Science Foundation.